The application is open until October 31, 2016. Scattering amplitudes are a fascinating and rapidly developing subject of current research, both in supersymmetric quantum field theories, as well as for applications to collider physics. At the same time, there are many connections to mathematics. This interplay between the different research communities is very fruitful. 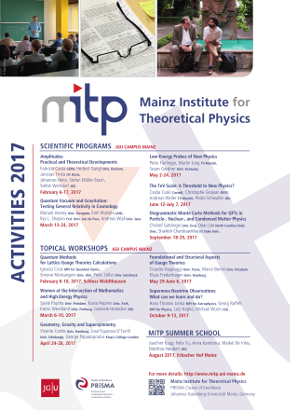 The MITP Scientific Program will bring together leading experts at this intersection from the fields of high energy physics, mathematics and string theory, to discuss the newest developments and to tackle currently open problems.